Kampala is the largest city and the capital of Uganda. In 2006 its population was approximately 1,189,000. The city was built over the old capital of the Buganda Kingdom located on Mengo Hill. Some buildings from the Kingdom still survive in the city such as the Buganda Parliament Building and the Buganda Court of Justice. Originally a city of seven hills, it is much larger today. The city is 1,300 meters (4,265 feet) above sea level in the southern part of Uganda, eight kilometers (6 miles) north of Lake Victoria. Thus Kampala experiences a mild climate even with its close proximity to the equator. In the Kiganda language spoken by the Buganda people, Kampala’s name was derived from the phrase kasozi k’ mpala, which translates to “hill of impala,” since the area once had a large impala population. In 1890, Frederick Lugard built a fort for the Imperial British East Africa Company near Mengo Hill and made it the capital of the Uganda Protectorate to help the British gain control of the Nile. After the British made formal claims to the land, the capital city was moved to the nearby city of Entebbe, about 30 miles away but Kampala remained the commercial and communications center and was a major industrial center of the protectorate. When Uganda became an independent country in 1962, the capital was returned from Entebbe to Kampala. In 1922 Makerere Technical Institute was founded. Today it is Makerere University, the oldest largest institution of higher education in East Africa. Kampala experienced political unrest during the times of it first president, Milton Obote and his successor, Idi Amin. During those two decades the national government could not construct an infrastructure of roads, bridges, and highways quickly enough to accommodate the large number of rural migrants to the city. Most of the many hills of Kampala are topped with religious institutions such as churches and mosques as well as hospitals and large hotels. The city’s lowlands frequently have flood-prone shantytowns, where the majority of the population resides. 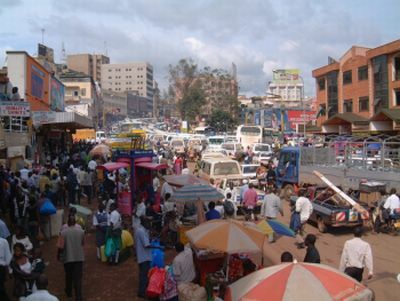 Over 75 percent of Kampala’s population lives close to or in poverty. Although the British had occupied Uganda for six decades, their architectural impact was slight unlike other African cities occupied by Europeans during the colonial era. Thus Kampala is known as a distinctly African city in architecture and culture. The city had approximately 100,000 Asian citizens before they were expelled by Idi Amin in 1972. That population has not returned. Kampala is today the home of the East African Development Bank. Anthony Appiah and Henry Louis Gates, Africana: The Encyclopedia of the African and African American Experience (New York: Basic Civitas Books, 1999); Kefa M. Otiso, Culture and Customs of Uganda (Westport, CT: Greenwood Press, 2006).